A shocking new 49-minute documentary from Japan’s public television broadcaster NHK titled “MELTDOWN: Cooling Water Crisis,” reveals new information on how corporate policy undermined efforts to keep the three destroyed Fukushima-Daiichi reactors stable one week after the triple reactor meltdown disaster began. See video here. Hear an interview related to the film here. 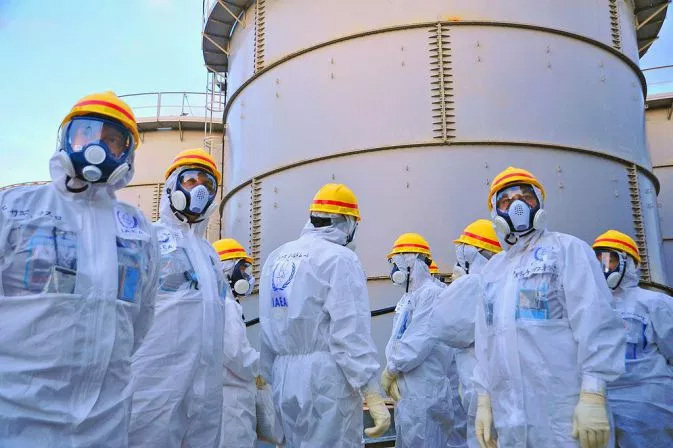 Members of the International Atomic Energy Agency covered up to tour the tank farm holding millions of gallons of radioactive cooling water at the devastated Fukushima-Daiichi reactor complex. They recommend dumping it in the ocean. Skeptical Japanese survivors of the Fukushima-Daiichi disaster are protesting state and federal plans to disperse and abandon large amounts of radioactive waste that was generated by the triple reactor meltdowns. Rachel O’Donoghue wrote in the London Daily Star April 29: “The country’s Environment Ministry wants to use the radiation-tainted material to rebuild a number of roads in the region that was devastated by a tsunami in 2011. But the proposal has sparked fury among residents over fears they could be poisoned by the soil.” An April 26 briefing about the plan “saw angry scenes erupt, with locals in the city of Nihonmatsu yelling about how the roads will be ‘contaminated.’ Authorities have been desperately trying to convince people that it will be safe, saying the soil will be buried under clean earth that will ‘block’ any harmful radiation.” Of course locals reply that the same was said about the reactors themselves. Roughly 28.7 million cubic yards of contaminated soil have been collected in 1-ton bags stacked in vast outdoor areas after being scraped from school yards, play grounds, hospital grounds and other public areas. Likewise, angry protests by fisherman have stalled government plans to dump millions of gallons of contaminated water now in storage into the Pacific Ocean. Seafood workers and others say more radioactive waste in the water will ruin the fishery. About 200 US citizens have re-filed a lawsuit against Tokyo Electric Power Co. which owns the Fukushima wreckage and an unnamed US firm seeking at least $1 billion for medical expenses related to radiation exposure suffered during the triple meltdowns. The suit was filed March 14 with federal courts in the Southern District of California and the District of Columbia by US participants in the relief effort made in the wake of the disaster. Hundreds of sailors on the aircraft carrier USS Ronald Reagan and others were heavily contaminated when clouds of radioactive fallout inundated the ship during relief efforts. Many of the plaintiffs are suing for a second time after a similar suit was dismissed by the Californian federal court in January. 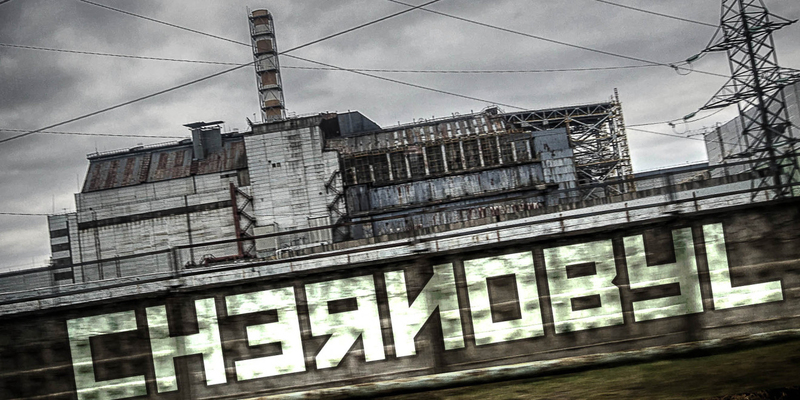 Photo: The cement tomb built in 1986 over the destroyed Chernobyl reactor No. 4 in Ukraine needed replacement by 1996. It finally got re-covered in 2016. Similar abandonment has been recommended for three wrecked General Electric reactors in Fukushima, Japan. March 11 marks the seventh anniversary of the Great Eastern Japan Earthquake and tsunami that killed over 18,000 people. 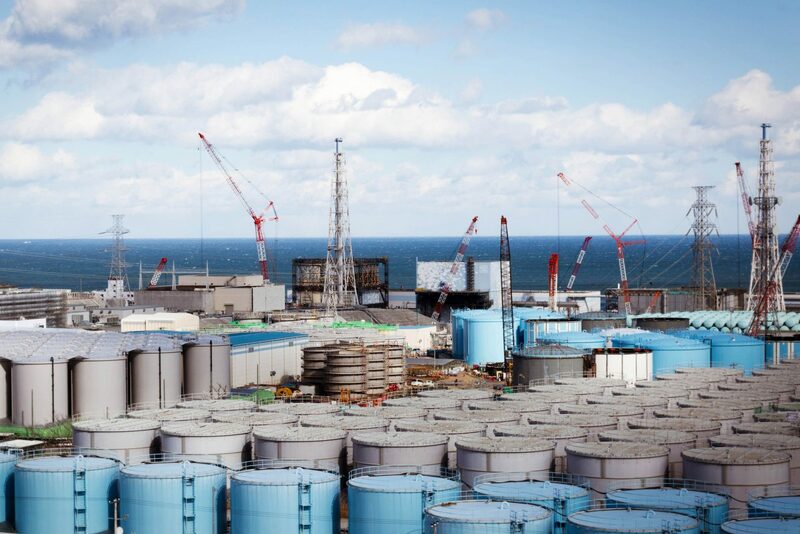 The quake destroyed the foundations and pipes of the Fukushima-Daiichi nuclear reactor complex, and caused a tsunami that crashed the site’s emergency back-up generators resulting in a “station blackout” and the world’s only simultaneous triple reactor meltdown. The consequent mass radiation releases, mass evacuations and mass contamination of the Pacific Ocean are unprecedented. 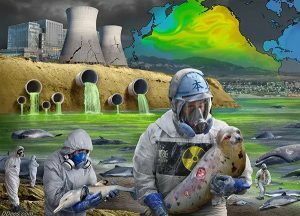 Only the 1986 Chernobyl disaster compares to Fukushima, although its radiation was dispersed largely to the atmosphere rather than the sea. “…the fact that there is no way of putting an end to earthquakes and tsunamis is … something that we must accept…. “However, the Fukushima Daiichi Nuclear Power Plant Disaster is neither a natural disaster nor ordained by fate. It is a human-made disaster brought about by bad faith. Unlike natural disasters, which are beyond human understanding, this was easily predictable and preventable. The officials of Tokyo Electric Power Co. [Tepco] say things like, ‘We could not imagine that a once-in-a-thousand-years earthquake might come,’ and ‘The tsunami was beyond our expectation,’ but these are only obfuscations. A major earthquake accompanied by a nuclear power plant accident was—as I will show in detail—something very much within the realm of possibility, a possibility these officials arrogantly refused to consider. Japan’s disaster reconstruction minister announced at a press conference last July 15 that he opposes dumping contaminated cooling water from the disaster-struck Fukushima Daiichi site into the sea, citing protests by local fishermen. While the minister has no control over how the waste water will be disposed, his comments came after several experts endorsed the ocean dumping. About 770,000 tons of waste water has been collected in over 900 densely crowded tanks on site, and the amount grows by 150 tons a day. 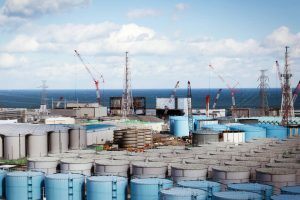 With limited acreage Tepco officials have said it can keep adding tanks only until 2020, and the tank farm is vulnerable to earthquakes that could spill the waste. The water becomes highly radioactive when it is poured over wreckage inside the three reactors in order to cool the three masses of “corium”—the hot uranium fuel and its cladding melted into a giant mass that has partially burned through the foundations. Most of the water is then treated in an experimental process that removes many radioactive materials but not the tritium, the radioactive form of hydrogen. Kawamura’s remarks were widely condemned and a Tepco spokesperson made a retraction saying, “The chairman meant to say that the decision to release is not yet final.” Minister Yoshino also asked dumping advocates “not to drive (fishermen) further towards the edge,” alluding to concern among local fishermen about the effects on their livelihood if the fish and other marine products they catch were to be contaminated. Tepco still knows so little about the state of the deadly melted fuel inside the three reactors that the most the company could say in January about its latest remote-controlled probe inside Unit 2 was, “the radiation reading [8 Sieverts] was taken near what appeared to be fuel debris.” (emphasis added). The harsh radiation environment inside the wrecked reactors is so novel and deadly that robotic probes and containment equipment haven’t yet been devised and have to be invented whole cloth. Seven years in, Tepco hasn’t yet positively located the melted fuel debris inside all three reactors. What surprised the January inspectors was a reading of 42 Sieverts per/hour “outside the foundations of the reactor.” Mycle Schneider, an energy consultant and lead author of the World Nuclear Industry Status Report, told the Independent, the company “hasn’t a clue what it is doing,” in decontaminating and securing the complex. * For a detailed review of the ongoing Fukushima catastrophe, see “Key figures for the seventh anniversary,” published Feb. 17 by the group ACROnique Fukushima. The group offers daily monitoring of events related to the current radiation disaster in Japan, and more. “Nearly seven years after the triple reactor meltdowns, this unique nuclear crisis is still underway,” Greenpeace International’s Shaun Burnie wrote in a blogpost last December. The word “unique” is an understatement but true. 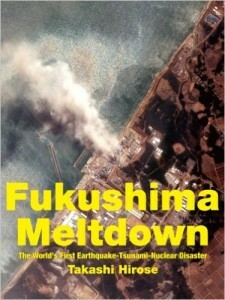 The March 11, 2011 meltdowns are the world’s first combined earthquake-tsunami-reactor catastrophe. Moreover, while other power reactors have run out-of-control, melted down and contaminated large areas, never before have three simultaneously suffered mass earthquake damage, station black-outs, loss-of-coolant and complete meltdowns. The consequences of its meltdowns-cubed are uniquely over three times deeper, broader and more expensive than anyone was prepared to handle. In the days following the initial quake, tsunami(s), and explosions, the head of the emergency response said, “There is no manual for this disaster.” Managers have had to invent, design, develop and implement the recovery whole cloth. Evacuation was so haphazard that on August 9, 2011, one local mayor accused the government of murder. The crisis is ongoing in many ways: radioactively contaminated water is still pouring into the Pacific Ocean (permanently contaminating and altering sea life which bio-accumulates and bio-concentrates the radioactivity); radioactive gases and perhaps even “hot particles” are still wafting out of destroyed reactor structures and waste fuel pools; the constant threat of earthquakes and tsunamis in Japan puts millions of gallons of radioactive waste (rad waste) water now stored near the shore in tanks at risk of spilling; and the dangerous work of collecting radioactive soils, leaves and tree trimmings from farmlands, school yards, parks and gardens continuously adds to vast collections of 1-ton radioactive waste bags. 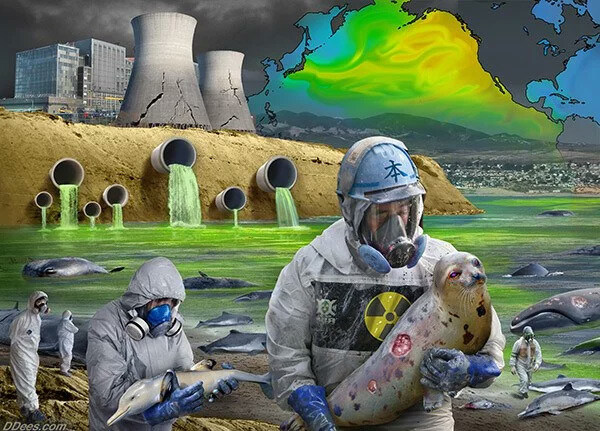 Fukushima’s endless radiation effects — from thyroid cancers, to contaminated sea food, from poisoned pregnancies to irradiated clean-up workers — should be the final insult from nuclear power and weapons. And they will be if the general public wises up to the unacceptable risks of continuing to operate nuclear reactors. Natural disasters will never disappear, Takashi wrote, and there is no way of putting an end to earthquakes and tsunamis. 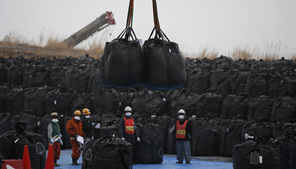 “However, the Fukushima Disaster is neither a natural disaster nor ordained by fate. 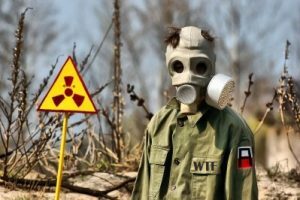 It is a human-made disaster brought about by bad faith.” In his terrifying 150 pages, Takashi methodically proves the case that the Fukushima catastrophe “was easily predictable and preventable.” In a nutshell, two principle government and corporate lies demonstrate how bad faith brought about the worst reactor accident in history. Exposing and rejecting these lies can prevent another meltdown. The other glaring example of bad faith has been Tepco’s repeatedly saying, “We could not imagine that a once-in-a-thousand-years earthquake might come,” and further that “the tsunami was beyond our expectation.” These are lies. The destroyed Fukushima reactors were hit by an easily imaginable 14-meter tsunami. In 1896, the Meji-Sanriku quake’s tsunami reached 38.2 meters on the Iwate coast not far from Fukushima; the 1933 Hokkaido quake caused a 28.7 meter tsunami. Indeed, since the late 1970s experts have warned that a disaster like Fukushima was possible. In the late 1990s, seismology professor Ishibashi Katsuhiko at Kobe Univ. coined an explicit new term meaning “nuclear-power-plant-earthquake-disaster.” Because Prof. Ishibashi’s many books on the subject are well-known, “it is impossible that his warnings were unknown to the officials of Tepco,” who just want to dodge criminal charges. The new Chairman of Tepco Holding, Inc., Takashi Kawamura, caused a public uproar in the coastal fish­ing community last April when he reportedly declared that almost 1 million tons of contaminated waste water stored in tanks onshore would be dumped into the ocean. But the company faced an im­mediate backlash, especially among fishers whose livelihoods have been devastated since the March 11, 2011 catastrophe, and quickly reversed itself. The company now says it has “no plans for an immediate release” and can keep storing water through 2020 or 2023. Scientists have declared the three-reactor disaster the worst radioactive contamination of the ocean in recorded history. About 300 tons of ground water rushes into three reac­tor basements through earthquake-destroyed foundations, mixes with the melted uranium fuel rods and becomes tainted with radiation. The waste water is then pumped out and filtered through an experimental process called Advanced Liquid Processing System. ALPS separates most of the dangerous isotopes but can’t remove tritium, the radioactive form of hy­drogen. It is this “tritiated” water that is stored in the large tanks. Japan’s government and Tepco argue that since nuclear reactors routinely release tritium to the air and water, the ocean dumping of 1 million tons of tritiated water to the sea would not be harmful. Tritium concentrates in aquatic organisms including algae, seaweed, crustaceans and fish. With a radioactive half-life of 12.3 years (half its radioactivity will decay in 12.3 years) it persists in the environment for 120 years. IEER President Dr. Arjun Makhijani, reports that “Tritium is a highly radioactive isotope of hydro­gen…. Since tritium has the same chemical proper­ties as hydrogen, it can combine with oxygen to form water. Such tritiated water is radioactive, and has become one of the problem pollutants at many nuclear facilities. In some places it has contaminated groundwater and surface water and continues to do so. … Commercial nuclear power plants also dis­charge tritium into public water bodies. Some of the 1,000 hastily-built tanks holding over 900,000 tons of highly contaminated cooling water at the Fukushima-Daiichi complex. Dozens of Navy personnel who were aboard the aircraft carriers USS Ronald Reagan and USS Essex when they went to Fukushima in March 2011 to render aid to survivors, have since suffered unusual health problems including fatigue, weight loss, swollen limbs, joint pain, stomach ailments and diminished eyesight. Stonewalled by the Navy, 420 sailors have joined a $1 billion class action lawsuit in federal court in San Diego against Fukushima’s owners, Tokyo Electric Power Co. (Tepco), and against General Electric which built the three destroyed reactors. Tepco and the Navy contend the sailors did not receive enough radiation exposure to have caused the illnesses. How­ever, Japan, South Korea, and Guam later declared the USS Reagan too radioactive to enter their ports. The court case is moving slowly—it was filed in 2012. According to Courthouse News, eight of the sailor-plaintiffs have already died—most from can­cer—since the first case was filed. The sailors are represented by some high-profile attorneys, includ­ing, among others, former US Sen. John Edwards and his daughter Cate Edwards. Cate Edwards told Courthouse News there are 23 plaintiffs living with cancer, many of whom served in Fukushima in their early 20s and some as young as 18. Beyond the group suffering cancer, many of the sailors have degenerative diseases, some have lost mobility, use of their arms and legs, some have back problems and eyesight loss. A 26-month-old toddler born to a sailor-father who served in Fukushima died from brain and spine cancer. One female sailor opted to end a pregnancy after finding out the fetus had severe birth defects, Edwards reported. Another sailor, who was pregnant during the mission and her “Baby A.G.,” who was born in October 2011 with multiple genetic muta­tions, are also plaintiffs. Six and a half years since the three-reactor disaster began, Tepco just began installing equipment to be used for removing waste fuel rods from the heavily damaged storage pool for reactor 3. The equipment, weighing 72 tons, was lifted by two large cranes.